Fukuoka is the largest city in the Kyushu region and has famous tourist destinations. Travelers from Korea, Taiwan and Thailand often visit Fukuoka. This article introduces methods to travel between Tokyo and Fukuoka. Fukuoka, which is the largest city in the Kyushu Region by population, is one of the most popular cities to visit in the area as it has famous local dishes and many tourist attractions. We will introduce methods to travel between Tokyo and Fukuoka and compare them. There are more than 50 Flights per day from Haneda Airport to Fukuoka Airport operated by ANA, JAL, StarFlyer as well as Skymark Airlines which allow you to arrange your plan as you want. The flight between the two cities takes about 2 hours. A one-way flight run by ANA or JAL costs from 15,990 to 41,390 yen. On the other hand, the one way flights run by StarFlyer and Skymark Airlines sometimes cost less than 10,000 yen if you catch their campaign period. A budget airline, Jetstar, also operates services from Narita International Airport. The price starts from 6,390 yen. But if you fly from the Narita International Airport, you need to take a bus or train to get to the Narita Airport, which takes about one to one and a half hours and costs 1,000 to 1,500 yen. Fukuoka Airport is pretty close to the city center and there are subway lines connecting the airport and the city, making it easy to reach your destination after arriving in Fukuoka Airport. Also, the airport itself has shops and restaurants which allow you to enjoy the time spent there. The schedules of the Shinkansen bullet trains could be affected by the weather, for example by typhoons. A Shinkansen train runs every 30 minutes between Tokyo station and Fukuoka Station. The ride takes about 5 hours and costs 22,520 yen. If you book a ticket earlier, you can get a discounted round-trip ticket which is 33,000 yen. Compared to the flights, it takes longer and costs you more. But if you like to get to see the landscape on the way, it can be the best journey for you. Night buses between Tokyo and Fukuoka have the longest travel time during the night among the Japanese bus lines. The price of the tickets starts from 7,500 yen. The ride takes 14 hours. It would be the option to take when flight tickets and Shinkansen tickets are sold out. Highway buses called "Hakata Gō" have premium class seats which cost a little over 15,000 yen. These buses are famous for their comfort. Premium class seats feature a private compartment style, tables and wider seats with massage functions. An iPad is at the disposal of the passengers. You can also get to use facilities such as a shower, saunas and pool at the Central Wellness Club Tenjin Solaria for discounted prices during your stay in Fukuoka. If you like a slow travel, we recommend you take this option. The highway tolls between Tokyo and Fukuoka cost 12,000 yen even you get a discount by using the ETC system. Also, you need to pay for fuel to drive for about 1,100km. When you consider all of these costs, it is not going to be the cheapest option. Besides it is also time-consuming. But if you have enough days to travel, want to stop by some places on the way and have other people traveling together with you, it will be a lot of fun. 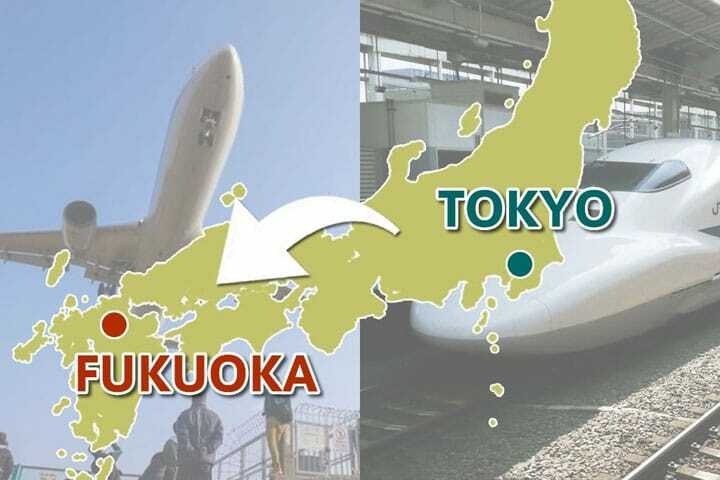 Most of the people who travel between Tokyo and Fukuoka choose to go by plane. But there are some more options to take into consideration, as mentioned in this article. So if you would like to try other methods beside flying and enjoy your own style of traveling, please consider the options above.